AMERICAN TROPIC is a "neatly plotted book with an exotic setting...power-packed thriller...rises to the level of ferocious dramatic polemic against some of the worst crimes against nature and by extension humanity." -- San Francisco Chronicle, Alan Cheuse, NPR critic. "FEVER DREAM ECO-THRILLER...incandescent, and fiery. Sanchez has an arresting voice and his own anger at the depredations of greedy developers and ignorant tourists infuses every page with a sense of near-apocalyptic doom." "Set in the same location as Thomas Sanchez's masterful MILE ZERO...revisits Key West in a tale of corruption, greed and eco-disasters." Pulitzer Prize Winner Philip Caputo, Author of "Acts of Faith" and "A Rumor of War. THOMAS SANCHEZ'S international bestseller, MILE ZERO, set in Key West, was hailed by the Washington Post as a "holy terror of a book of immense power and passion," lauded by Vanity Fair as "mythmaking and magisterial," and acclaimed by the New York Times as "dazzling." 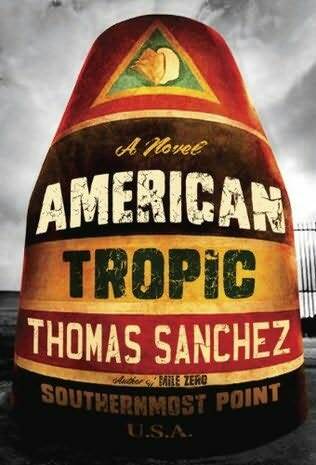 SANCHEZ returns to Key West, America's famous Southernmost Continental point, with a heart-racing ecological thriller, AMERICAN TROPIC. The exotic island city of the Florida Keys is being terrorized by a series of bizarre deaths carried out by a mysterious voodoo assassin. With each new kill, it becomes clear that the skeleton-clad executioner has an ecological agenda. The novel propels us through a complex maze populated by defenders of America's only continental reef, rapacious developers, ruthless scammers, destroyers of marine life, and common people enagaged in defiant acts to save their paradise. Everyone dreads being the assassin's next victim as the clock counts down to the end of hurricane season and a final dramatic explosion of fear and rage. AMERICAN TROPIC illuminates a world of dark desires, hidden truths, and colliding destinies with striking revelations.